In recent years, laptop, tablet, and cell phone usage has skyrocketed. With billions of devices currently in use that look just like yours, how’s a girl or guy to tell the difference between them? 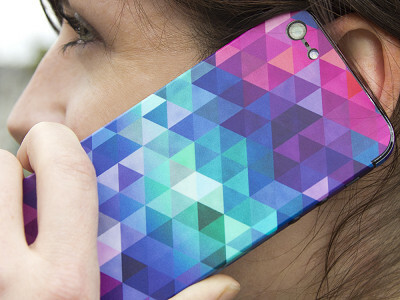 That’s where DecalGirl comes in with a line of high-quality removable skins that provide unique full-coverage designs for your electronic devices. Featuring original, one-of-a-kind artwork from American artists and designers, this assortment of decals sets your device apart from the rest, and even provides a bit of protection from everyday scuffs and scratches. Made from premium-grade vinyl with a no-bubble, no-residue adhesive backing and carefully cut for precision fit, DecalGirl skins are incredibly easy to apply and remove. Don’t let the name fool you. These skins are not just for girls. But, the company was started by one. It all began when Amanda Peters, a grade school teacher by trade and car enthusiast by hobby, told her ecommerce developer husband that she wanted to make a full-color decal for her car. After finding out the cost, the couple decided to take matters into their own hands; they bought a commercial-quality printer so they could make and sell high-end full color car decals themselves. Not long after, they used the very same materials to decorate an old X-Box game console. It was just a matter of time before laptops, tablets, and mobile phones became DecalGirl’s main focus. In a sea of electronic devices, these decals are a creative way to personalize yours and help it stand out. Hi, I’m Amanda, COO and Co-Founder of DecalGirl. I am so excited to introduce you to our product! At DecalGirl we make the best quality skins we can! DecalGirl skins go on smoothly and can be easily removed without leaving behind any residue on your devices. Our skins fit tightly and can last for years – or until they are changed out for a new one. If you are looking for an electronic accessory to personalize your gadget world you have found it! I would love to answer any questions you may have about our skins so comment below and lets talk! Do you have anything for the NOOK Color? @gigi It sounds like you have the 13" Pro! :) Yes it should fit! Please make skins for Kindle Fire. I'd buy one. Thanks! Will you be adding I Pad skins? @Gretchen Maybe :) I can certainly suggest it to the Grommet team! @Amanda Peters - Co-Founder oh yes!! Please, please do suggest! I have been a long time fan of DecalGirl and can attest to the quality of this amazing product. My husband gave me a Kindle for Valentine's Day 3-4 years ago and enclosed a stunning skin from DecalGirl. I was blown away with the art alone but the fact it was super easy to apply, adjust, etc., sold me. I've purchase more since then for other family members. All love it as much as I do! My number 1 wish is a decal for my iPad. Thank you for suggesting it! @Karen Marie Thank you so much!! We love to hear from our fans :) I am so glad you found us here too! We are very excited to be featured on The Grommet and its great to see your post. Hi Amanda! So exciting to see a great American product! Would you happen to have anything for a Samsung Galaxy 10 tablet? Do you have anything for a Samsung Galaxy Discover? @Guest I am sorry at this time we do not, but I can certainly suggest that to our developers to see what we can do! Any for the iPad 4th gen? 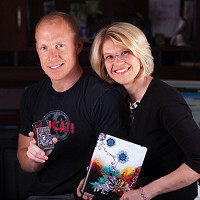 @Kathleen We will be happy to also discuss our iPad 4 skins with The Grommet team as well. Thanks so much for asking. I have a Nexus7-2013, that came out in August, and require some sprucing-up. As a google geek in need of some mini-Tablet TLC, do you thnk that they would be able to produce a decal, whose skin would cover the entirety of my current device ?? @Lenny We do them! Let me see if we can talk the Grommet team into offering them on the site! Is this it for patterns? I have a 16 year old high school boy who would love this for his MacBook, but the designs aren't really geared in that direction. Thanks! I love this! @Guest These are the only patterns that The Grommet is offering at this time, though we hope to expand their selection soon! It turns out I just bought a laptop skin from DecalGirl, and I was hoping to be able to load a matching wallpaper. Can I download the graphic from somewhere? Wish you had decals for computers that aren't Apple, those are way out of my price range. I also have a Kindle Fire HD that I wish I could decal as well. I have a Samsung S4 Active - will any of your skins fit? Do you sell any skins for smartphones? @Jeanne C. We sell skins for hundreds of cellphones! We do not have all of them but the majority of the best sellers we support! I've got a fabulously stunning DecalGirl skin on my Samsung Galaxy Tab 2. It went on easily and has withstood extensive use of the tablet. Every time I pull out my tablet, I get compliments from everyone around me. This is a GREAT product!! @Ada Thank you so much!! Its so great to hear from you! In recent years, laptop, tablet, and cell phone usage has skyrocketed. With billions of devices currently in use that look just like yours, how’s a girl or guy to tell the difference between them? 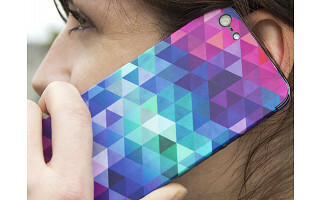 That’s where DecalGirl comes in with a line of high-quality removable skins that provide unique full-coverage designs for your electronic devices. Featuring original, one-of-a-kind artwork from American artists and designers, this assortment of decals sets your device apart from the rest, and even provides a bit of protection from everyday scuffs and scratches. Made from premium-grade vinyl with a no-bubble, no-residue adhesive backing and carefully cut for precision fit, DecalGirl skins are incredibly easy to apply and remove. Don’t let the name fool you. These skins are not just for girls. But, the company was started by one. It all began when Amanda Peters, a grade school teacher by trade and car enthusiast by hobby, told her ecommerce developer husband that she wanted to make a full-color decal for her car. After finding out the cost, the couple decided to take matters into their own hands; they bought a commercial-quality printer so they could make and sell high-end full color car decals themselves. Not long after, they used the very same materials to decorate an old X-Box game console. It was just a matter of time before laptops, tablets, and mobile phones became DecalGirl’s main focus.